Sorry, it's a mk4 1.8 tdci zetec (2008). I've tried all combinations of buttons held down simultaneously, but to no avail. I've also tried disconnecting the battery for 20mn. All it achieved was having to reset the clock and the one-touch-up windows. Any idea? I have the same car with same problem! (Recently posted on this myself Here)..I've looked it up on the net and apparently its down to bad electrical connections in the switches. According to most the only way to cure it is either clean connections or replace switches which involves removal of steering wheel and airbag etc etc. I didn't fancy all that hassle so I looked down the sides of the switches and could see 4 very small square holes. These holes are just big enough to get the end of a small straw down so I sprayed down each one with contact/switch cleaner. This I did a week ago and normal operation was resumed instantly and has worked fine ever since at all speeds... Worth a try for a 5-minute fix! Thanks, I'll give it a go. Not sure I've got contact cleaner, would WD** do the job? In any case, thanks for your help, I thought it'd be a silly thing. No mate its not at all like wd40... 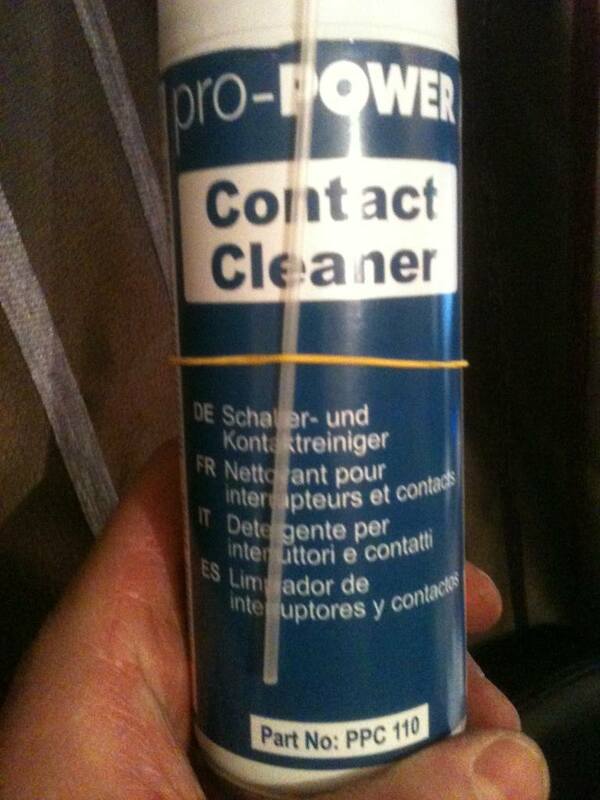 This stuff I have is called "pro-power contact cleaner".... If you google it its available for £3-4 a can. It's designed to clean up and enhance "electrical conductivity and contacts"... Basically it's used to clean up dirty/poor contacts in hifi and amplification equipment... Though I don't want to shout too soon since I squirted it into those holes the cruise has come back and has not gone wrong since. That was two weeks ago and I do find myself checking it all the time out of paranoia! If you do decide to replace there's a set on eBay at the moment item 29112151005 and run out in 14 hrs from now... Current price £5.50!!! Thanks for all the info, will give it a go and report back. Good luck with it and let me know! BTW I found the best way to do it was to first start the engine then squirt the contact cleaner into the holes in the side whilst simultaneously pressing the cruise stand by switch repeatedly until it started working. On a different note... I don't know the spec of your mondeo, but did you know if you haven't got footwell lights the wiring and bulb holders are probably there ready! My 1.8 TDCI Zetec didn't have them but all it took were a couple of 5w capless bulbs at 13p each and hey presto... Instant upgrade!!! My cruise control don’t come on, all I get is the message Cruise Control Stability? Any ideas?